In these times of smaller cars and engines all in the name of gas mileage, the 707-horsepower Challenger Hellcat sticks out like a sore thumb. Actually it’s more like a giant middle finger, a throwback to the days of big bodies and big V8s. If you want to buy one of these beauties it’ll cost you at least $60,000—and likely much more—which isn’t the worst price in the world. But that’s the low end. If you run into a greedy/smart dealer or re-seller you could pay up to $80,000 for a Challenger Hellcat. Still, that’s not awful at all. However, what will the Challenger Hellcat be worth a few years down the road? Will it appreciate and become a steal of a deal at $80k or will it be worth half that? Call me a pessimist, but I don’t see the Challenger Hellcat as a good investment. For starters, it’s just not rare enough. According to Hellcat.org, a total of 7,168 2015 Challenger Hellcats were made, in addition to 1,334 Chargers. That number would have been higher had Dodge known what a hit its big V8 would be and if it didn’t encounter supplier problems. Dodge ramped up production to meet demand, which is the first blow to the Challenger Hellcat’s legitimacy as an automotive investment. When it comes to cars that appreciate over time, rarity is a big factor. 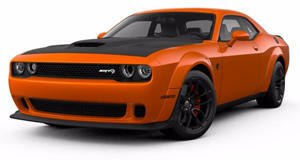 We have no idea when the Hellcat’s run will end but rumors have said Dodge is thinking of abandoning the supercharged HEMI V8 in favor of a twin-turbo V6 after the 2019 model year. That’s just a rumor but the production of the Hellcat can’t last forever, not in these emission-conscious times. There are already almost 8,000 of these bad boys on the road. Is a production run of 20,000 or more really hard to envision? Another thing that hurts the Challenger Hellcat is that its appeal comes from its engine. But unfortunately that engine is available in another car—the four-door Charger—and even an SUV. The cars that end up becoming truly great automotive investments don’t often have a ton of closely related kin. Usually these cars become collectible (and therefore valuable) because there’s nothing else like them around. That’s just not true when talking about the Challenger Hellcat. The unfortunate truth is that the Challenger Hellcat is an attractive short term investment. Yes, we’re talking about car flippers. The fact that Dodge can’t build these things fast enough means that being the first to get your hands on something like a six-speed manual in Plum Crazy Purple basically guarantees a return on your investment and then some. But at the end of the day a car like the Challenger Hellcat isn’t purchased because it’ll put the kids through college in ten years. No, the appeal of Dodge’s dinosaur is in the way it makes you feel when you step on the gas pedal and hear that supercharged engine roar to life. It’s in the heads that turn when you rumble down the street, every pair of eyes—at least those that belong to gearheads—looking to see if your Challenger wears a Hellcat badge. That's priceless American automotive nostalgia right there. That ensures this muscle car will be a great investment for those who love to drive long after prices on the resale market have plummeted.